Item # 310502 Stash Points: 5,495 (?) This is the number of points you get in The Zumiez Stash for purchasing this item. Stash points are redeemable for exclusive rewards only available to Zumiez Stash members. To redeem your points check out the rewards catalog on thestash.zumiez.com. Represent the tiger blood within your veins with the Neff Tiger Stripe Multicolor Short Sleeve Button Up. This vibrant patterned shirt features a full button up placket and fold-over collar for a classic silhouette that boasts striking color. Extremely soft in construction, this button up certainly does not sacrifice comfort for it's fashion forward appearance. 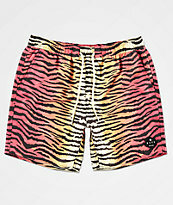 Tiger Stripe Multicolor Short Sleeve Button Up from Neff. Multicolor tiger stripe print throughout.